Officially the night before the 2010 Vancouver Winter OLYMPICS!!! Almost surreal. It's what VANCOUVER has been planning and planning and planning and now less than 24 hours away - can't wait. 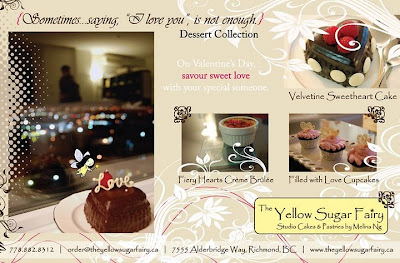 Well besides the OLYMPICS let's not forget ~ Valentines Day is just around the corner and for those of you who don't really know what to do: I just received the perfectly; timely email from The YELLOW SUGAR FAIRY. Check out what she has to say. Besides sharing spoonfuls or bites from my collection with your special someone, my desserts are great for girl's dessert nights, dinner parties, bridal showers, anniversaries, etc. --a very satisfying sugar boost during a coffee break or a meeting. Should you be interested in ordering a collection piece or two, please feel free to email or call for details and pricing. Even if you are not a fan of sweets, I look forward to hearing any comments/feedback you may have about my creations. Feel free to forward this email to your families, friends, coworkers and business contacts if you think they may be interested in edible Valentine's Day gift ideas or custom design cakes. May you enjoy the taste of love as much as I enjoy making it!